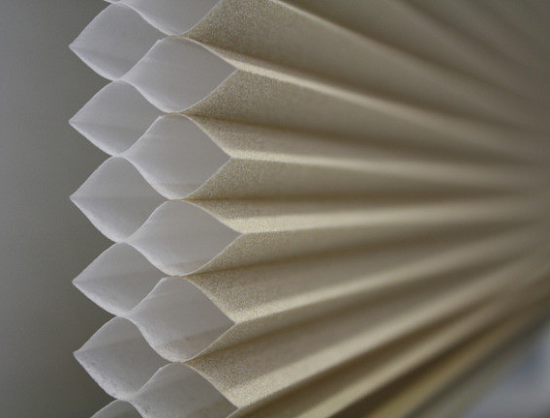 Honeycomb blinds, also known as cellular shades, are unique window treatments that are not only modern and popular but an energy saver of sorts too. Before I delve into the ways to clean honeycomb window blinds, let me briefly explain what they are. Produced from materials pleated into a honeycomb shape, these blinds, also known as cellular shades or accordion blinds comprise of compartments, not unlike honeycombs in a colony of bees. They consist of cellular compartments that actually trap air. The cellular compartments which come in layers - single, double, and triple layered cells, trap air, causing it to act as a form of insulation that keeps the temperature of the room cool in the summer and warm in winter. This translates to savings of your household's energy bills. The more layered cells, the more energy efficient the blinds are. Honeycomb window shades are quite popular because they are versatile in that you can use them in any interior space of your home – kitchen, bathrooms, bedrooms and living room where they can be combined with soft window treatments to create a dramatic effect. All you need is some creativity or a bit of browsing online to help ‘fire up’ your imagination. They are distinguished by a crisp clean style, are designed to roll up and down a window in an accordion fashion. But how do you maintain and clean honeycomb window blinds? In addition to being a lovely window enhancement, one great quality about these kinds of blinds is that they are quite easy to maintain. Asides the fact that they don’t get dirty easily, neither do they stain as fast as soft window treatments, honeycomb shades only need to be cleaned and dusted occasionally. If you have a busy lifestyle and therefore prefer a window treatment that’s a breeze to maintain, cellular shades are your best choice. But while they normally manage to stay clear of stains and dirt, for longer than the others, it’s good to give them some cleaning once in a while so they retain their clean crisp ‘spanking’ look. Plus if you keep your windows open very often, they’ll need the occasional dusting. And . . . they are easy to clean if you can just spare an hour or so, twice a year, to do the task. Beginning at the top, and working across the layered cells, while moving down gradually, dust the honeycomb blinds carefully from top to bottom with the feather brush. If a lot of dust has accumulated on the blinds, use the vacuum brush but ensure you use it gently. You don’t want to damage your blinds. Do this on both sides. If you feel there is a film of dust within the cells, blow out from one end of the blinds using a blow dryer. It is important that you use the ‘no heat’ setting. You don’t want to ruin or warp your window blinds. Keep the blow dryer about a couple of inches from the edge to ensure the air blast doesn’t bend its shape. If you have spots of dirt or stain, spot-clean the area. You should dab the spots with a soft sponge dipped in soapy water using very mild soap. A mild fabric washing liquid will do just fine. After removing the stain, dab the spots again, but with clear water and a clean sponge. In the event that your honeycomb blinds have become REALLY dirty, you may have to wash them very gently. To do this, fill a bathtub with lukewarm water, add fabric washing liquid; not too much because you don’t want heavy suds for obvious reasons. Place the blinds gently in the water. Allow the water to cover them. With a soft brush, clean the cellular shades on one side turn it over and do the second side. Drain the water and rinse the blinds. Air dry; when they are dry, hang them back up. It’s quite easy to clean cellular shades once you get the hang of it, and you’ll find it’s an easy DIY task. No need to call in the expensive “professional cleaners” to do such a simple task of maintaining and cleaning your honeycomb blinds. Just 'roll up your sleeves' and get cleaning!